French Naval Aviation (often abbreviated in French to: « l'Aéronavale », or « Aviation navale » or more simply « l'Aéro ») is the naval air arm of the French Navy. The long-form official designation is Force maritime de l'aéronautique navale. Born as a fusion of carrier squadrons and the naval patrol air force, the Aéronavale was created in 1912. The force is under the command of a flag officer officially named Admiral of Naval Aviation (ALAVIA) with his headquarters at Toulon naval base. It has a strength of around 6,800 military and civilian personnel. It operates from four airbases in Metropolitan France and several detachments in foreign countries or French overseas territories. Carrier-borne pilots of the French navy do their initial training at Salon-de-Provence Air Base after which they undergo their carrier qualification with the US Navy. Cockade of Naval Aviation. The naval anchor on this insignia was generalized between 1940 and 1945. Aérospatiale Alouette III France Rotorcraft Utility 18 Retired. Active bases of the French naval air arm (status 2013). Immediately after the end of the war, the Aeronavale only had Supermarine Seafire Mk.III (Flottille 1F) and Douglas SBD Dauntless dive-bombers (Flotilles 3F et 4F). The flight personnel of the French Navy falls into three categories: fighter aviation, fixed-wing aviation and helicopter aviation. Fixed wing Rafale M Landivisiau Strike Fighter  Ended conversion to Rafale M on June 2016. Det. PEDRO Rotary Eurocopter AS365 Dauphin Hyères Plane guard Not part of the GAE. The Charles de Gaulle sets sail to cruises with 2 Dauphin helicopters from 35F. Fixed wing Atlantique II Lann Bihoue Anti-Submarine Warfare / Naval patrol  Detachments at Dakar and Djibouti. 25F Fixed wing Falcon 200 Guardian GAM Faa’a Maritime surveillance / Search and Rescue  Detachment at Nouméa. 34F Rotary Westland Lynx Lanveoc Anti-Submarine Warfare To convert to NH90 Caiman. 35F Rotary Eurocopter AS365 Dauphin, Alouette III Hyeres Search and Rescue Detachments at La Rochelle, Le Touquet-Paris-Plage and Faa’a. 10S Rotary/ Fixed wing/UAV Alouette III, Westland Lynx, Schiebel S-100 Serval Hyeres Experimental Aviation and airborne weapons research and development, evaluation at several locations. Insignia of pilots of Naval aviation. Arm insignia of personnel of Naval aviation. Rafale fighter on the flight deck of Charles de Gaulle at dawn. From 1951 to 1956, 164 Grumman Avengers were delivered to French Naval Aviation. They remained in service until 1965. The Corsair F4U-7 was the first new aircraft delivered to the French Navy after 1945. It saw action during the Indochina war, Algerian war and operation Musketeer. The Martin P5M-2 Marlin served in the French navy between 1959 and 1964. 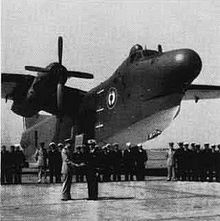 During the Algerian War of independence, the French Navy flew Lockheed Neptunes on surveillance patrol to fight weapons smuggling by sea. The Crusader was the air superiority jet aircraft of the French navy for 35 years. The Canard Voisin was the first seaplane used by the French Navy. ^ "En attendant le H160, l'armée va louer des Dauphin pour remplacer ses antiques Alouette". Archived from the original on 2018-01-23. Retrieved 2018-01-23. ^ "Flotilla 4F". French Navy. Retrieved 25 October 2016. ^ "Flottilla 11F". French Navy. Retrieved 25 October 2016. ^ "Flottilla 12F". French Navy. Retrieved 25 October 2016. ^ "Flottilla 17F". French Navy. Retrieved 25 October 2016. ^ "Flottilla 21F". French Navy. Retrieved 25 October 2016. ^ "Flottilla 23F". French Navy. Retrieved 25 October 2016. ^ "Flottilla 24F". French Navy. Retrieved 25 October 2016. ^ "Flottilla 25F". French Navy. Retrieved 25 October 2016. ^ "Flottilla 31F". French Navy. Retrieved 25 October 2016. ^ "Flottilla 33F". French Navy. Retrieved 25 October 2016. ^ "Flottilla 34F". French Navy. Retrieved 25 October 2016. ^ "Flottilla 35F". French Navy. Retrieved 25 October 2016. ^ "Flottilla 36F". French Navy. Retrieved 25 October 2016. ^ "Flottilla 28F". French Navy. Retrieved 25 October 2016. ^ "Military Factory - Site detailing past and present military systems and technology including aircraft, vehicles, guns and navy vessels of the world". Archived from the original on 2017-08-22. Retrieved 2017-08-22. ^ "Office of the Historian". www.history.state.gov. Archived from the original on 2017-08-21. Retrieved 2017-08-22. Wikimedia Commons has media related to Naval aviation of France.